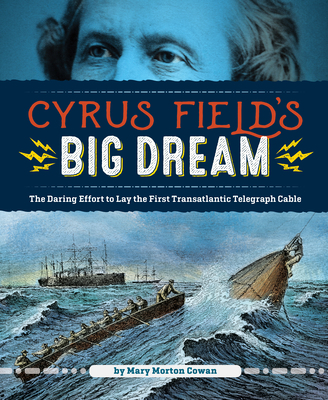 Explore the extraordinary achievement of Cyrus Field and one of the greatest engineering feats of the 19th century: laying a transatlantic telegraph cable to create instant communication between two continents. Cyrus Field had a big dream to connect North America and the United Kingdom with a telegraph line, which would enable instant communication. In the mid-1800s, no one knew if it was possible. That didn't dissuade Cyrus, who set out to learn about undersea cables and built a network of influential people to raise money and create interest in his project. Cyrus experienced numerous setbacks: many years of delays and failed attempts, millions of dollars lost, suspected sabotage, technological problems, and more. But Cyrus did not give up and forged ahead, ultimately realizing his dream in the summer of 1866. Mary Morton Cowan brilliantly captures Cyrus's life and his steadfast determination to achieve his dream. Award-winning author, Mary Morton Cowan, has focused on writing for young readers for more than twenty-five years. Cyrus Field's Big Dream is her second biography. Earlier books include: Captain Mac: the Life of Donald Baxter MacMillan, Arctic Explorer, which received multiple awards, including the National Outdoor Book Award and the Society of School Librarians International Honor Book Award; Timberrr... A History of Logging in New England, for which received Maine Library Association's Lupine Honor Award; and a historical novel, Ice Country. Her articles and stories have been published in more than eighty issues of children's magazines, and several have been reprinted in textbooks and anthologies. A member of Maine Writers and Publishers Alliance and SCBWI, Mary is a visiting author in schools and speaks to a variety of community groups. She and her husband live near Sebago Lake, ME.